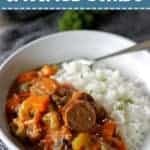 Inspired by the authentic New Orleans dish, this is my take on spicy chicken & sausage gumbo! 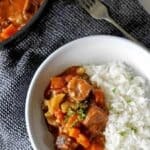 Easy to make and full of cajun spice flavours, this easy weeknight meal will be a new favourite! Our honeymoon to the Southern US in June was pretty much centered around farms and food. But mostly food. Especially once we got to New Orleans. Our whole 3 days was planned around where we would eat…it was a good time! Josh was pretty much dragged around the city on a never ending hunt for delicious food, which I’m sure was really hard for him…ha! I had a food bucket list of things I needed to eat. Beignets, pecan pie, fried chicken & waffles, gumbo. All the New Orleans classics. 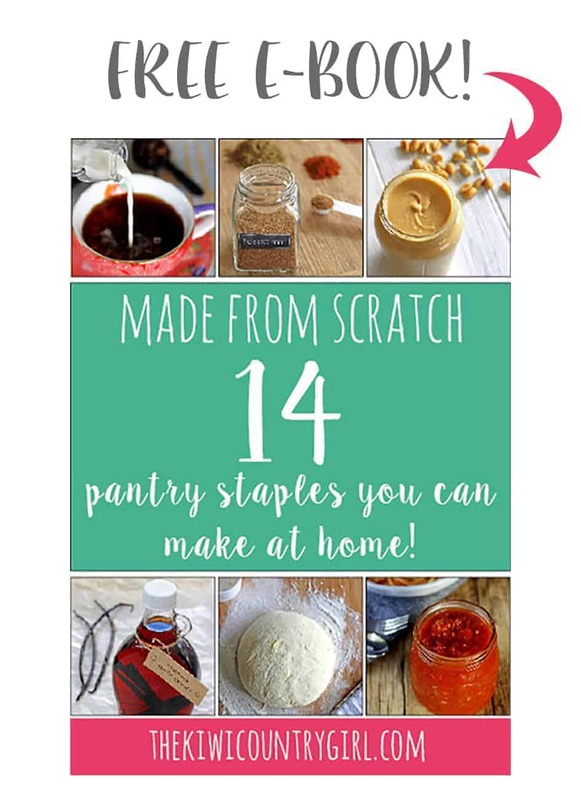 And we ticked every single one off the list! One of the nights we were there we went to a little place called Coop’s Place. They had a really good looking menu including a taste plate which gave you a little bit of everything – fried chicken (Josh’s favourite), rabbit & sausage jambalaya, red beans & rice, shrimp creole & seafood gumbo. OMG. It was all incredible. The flavours were out of control – there was heat, but only enough to help it pack a punch without leaving you sweating. So obviously once we got home, New Orleans cooking had to be on the menu, and chicken & sausage gumbo was up first! 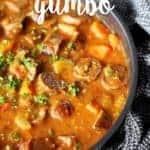 I’m definitely not going to call this an authentic gumbo because I didn’t learn it from my grandmother who has lived in Louisiana all her life, but I searched around and got a bit of inspiration from a few places and this is my take on it. We loved it. It had the flavour, a little bit of heat and was really easy to make. I had definitely convinced myself that gumbo was going to be a Sunday afternoon activity but it all came together in less than an hour! 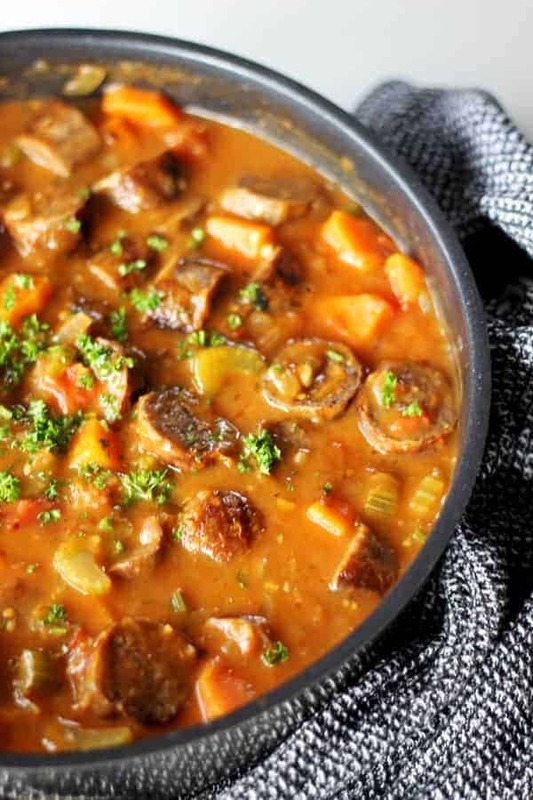 It’s the perfect winter warmer and is pretty versatile. I had intentions of it being chicken & chorizo but the first time I made it I had no chorizo so used regular sausages. That was so good that I stuck with it but then when I went to make it for the blog I forgot to get chicken so this version is made with just sausages and it was just as good! First up, cook the chicken & sausage in a frying pan until it is browned and then set it aside. You don’t want to clean the pan at this point…all the little bits of meat that have stuck to the pan are what adds to the flavour! Next up is a basic roux, but using oil instead of butter. I would usually use butter but all the recipes I saw for gumbo used oil, so there was no way I was going to buck tradition! Add the oil and flour to the pan and cook until it is a coppery brown colour. This will take about 5 minutes. Make sure you keep an eye on it and stir the whole time – it will go from brown to burnt really quickly. When it is ready, add the chopped onion, garlic, carrot & celery and cook for another 5 minutes. Add the tomatoes, chicken stock, bay leaves & cajun seasoning and bring to the boil. Reduce heat to low and simmer for 15 minutes covered, then remove the lid, add the chicken & sausage back in and simmer uncovered for a further 15 minutes. Remove from the heat, fish out the bay leaves and stir through a handful of chopped parsley and serve it up on a bowl of white rice. 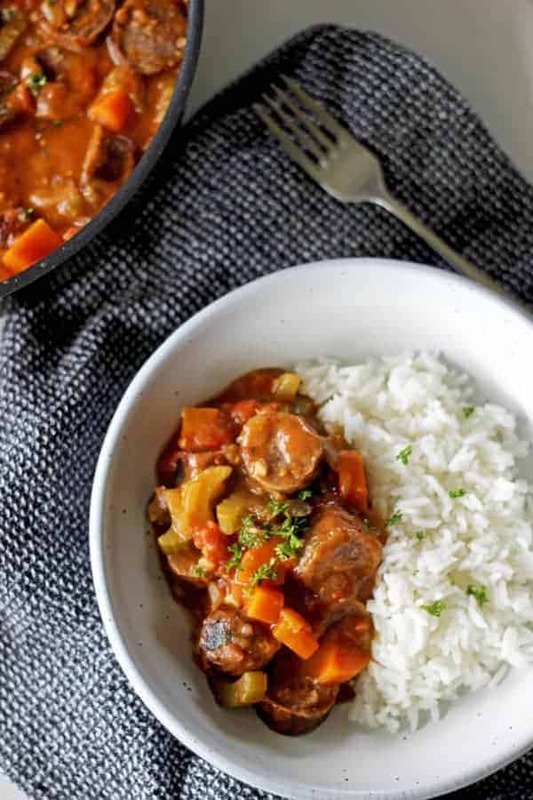 This spicy chicken & sausage gumbo is the perfect winter warmer – it’s a little bit spicy, full of flavour & the perfect Sunday night meal to make you feel like you’re sitting in a bar in New Orleans! 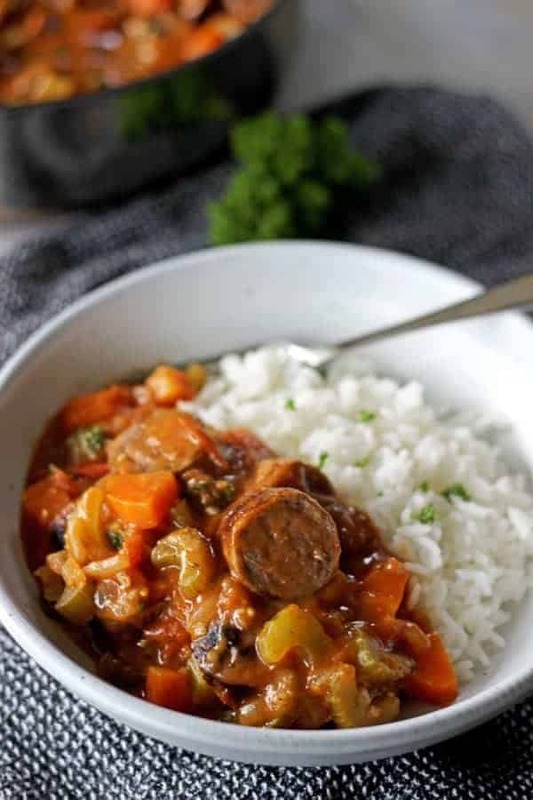 Inspired by my favourite New Orleans dish, this is my take on spicy chicken & sausage gumbo! 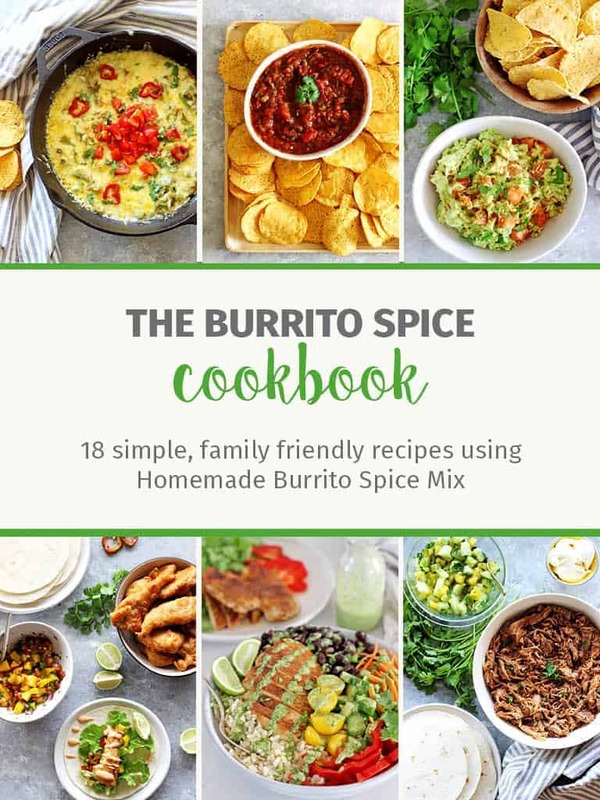 Easy to make and full of flavour! Cook the chicken & sausage in a frying pan until browned and set aside. Don’t clean the pan - this adds to the flavour! Add the oil and flour to the pan and cook until it is a coppery brown colour. This will take about 5 minutes. Make sure you keep an eye on it and stir the whole time - it will go from brown to burnt really quickly. Add the chopped onion, garlic, carrot & celery and cook for 5 minutes. Add the tomatoes, chicken stock, bay leaves & cajun seasoning and bring to the boil. Reduce heat to low and simmer for 15 minutes covered, then remove the lid, add the chicken & sausage and simmer for a further 15 minutes uncovered. Remove from the heat, take out the bay leaves and stir through the chopped parsley. 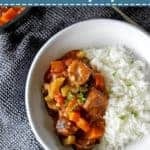 I’ve not had gumbo before but have always been keen to try, now you have made it easy thank you & thanks for sharing with YWF too. 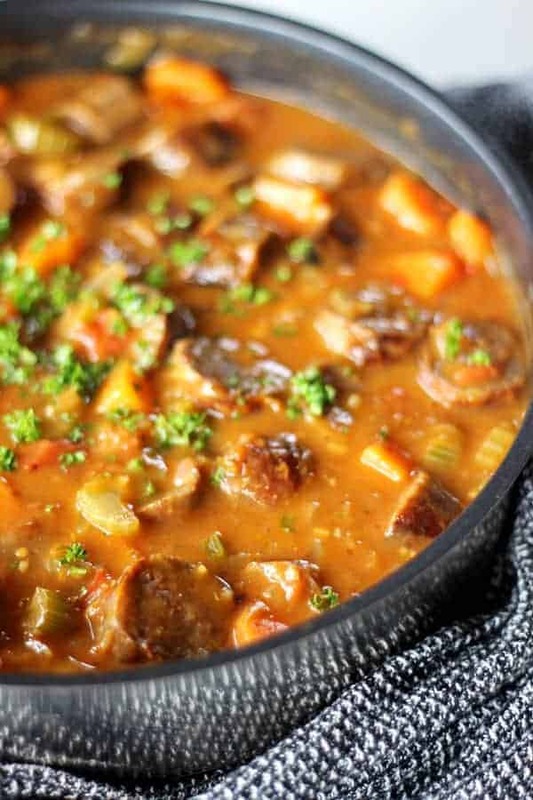 I am a big fan of gumbos and totally love this combination of chicken and sausages….. Thanks Dhanya! Chicken & sausages and great together! I totally have a food bucket list any time I travel anywhere too! 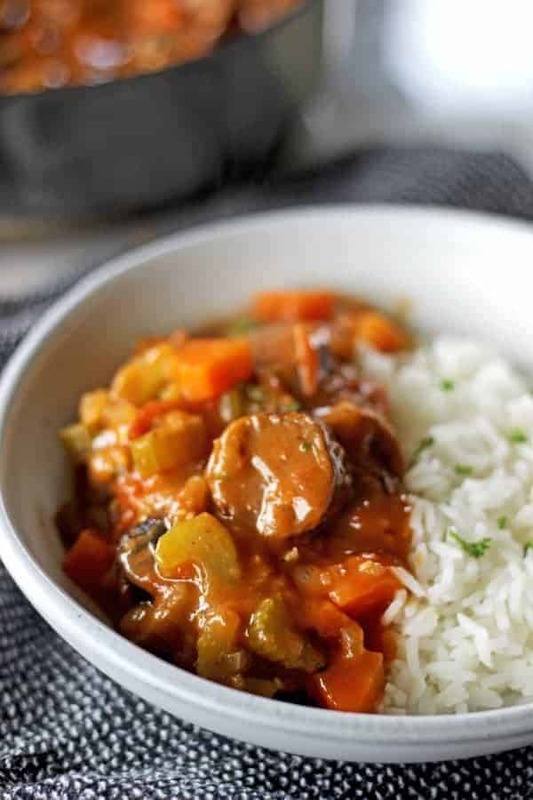 I’ve never tried gumbo before but it looks really great. Also do you know how you pronounce it? Is it gum-bo or jum-bo?